The two dozen or so resident Mayfield peafowl make wonderful park greeters. Look for them in the trees, on the rooftops, lying in the gardens, and just wandering the grounds. They sometimes wander throughout the preserve also. Please drive carefully near this parkland as the Mayfield peafowl roam the area freely. Peafowl have been killed by cars driving on W 35th St.
Winter – The long tail feathers grow out on the adult males. Late winter/Spring – The peacocks start fanning their tails to court the females. This starts around February and continues throughout the spring. 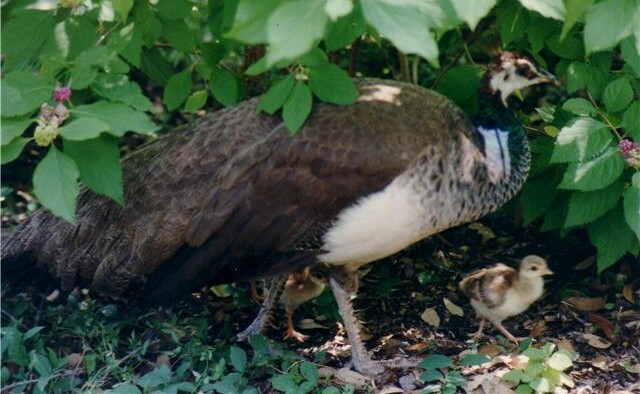 Spring – Peahens will sit on their nest of eggs. Nests appear in surprising places throughout the park and preserve. 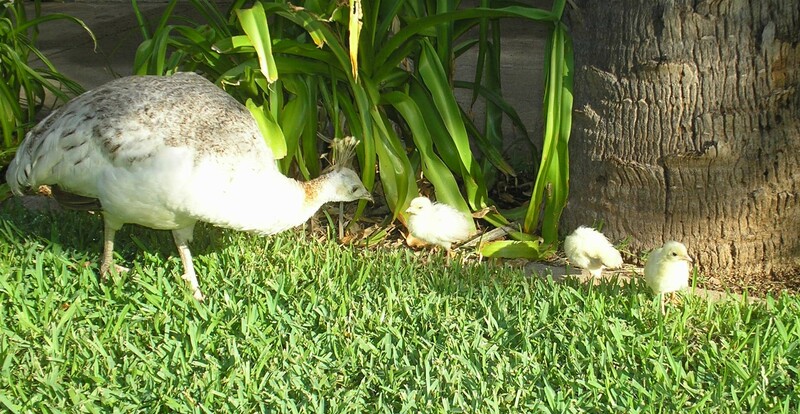 Late Spring/early summer – The peachicks hatch. 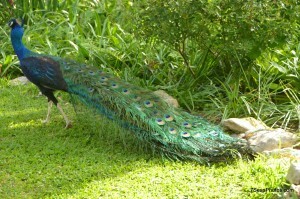 Summer – The peacocks loose their long tail feathers (July/early August). Peacocks are the males, peahens are the females and peachicks are the babies. 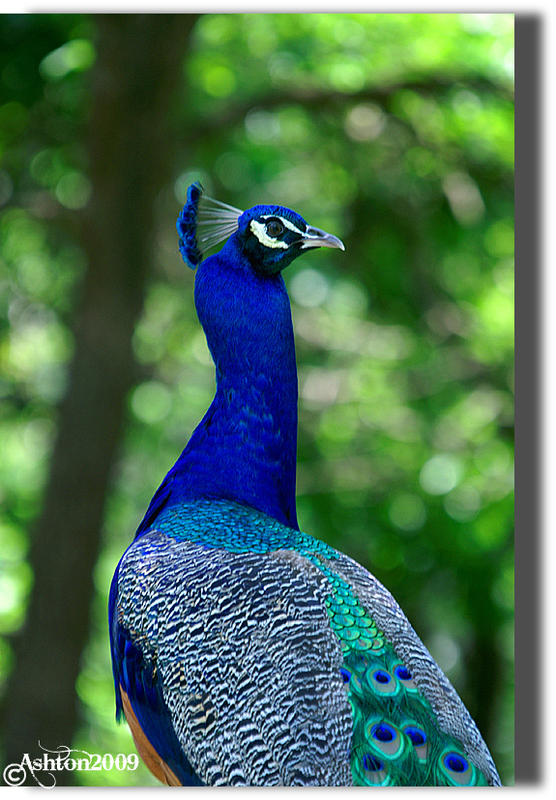 The less common word for the birds is peafowl. Peacocks for both male and female peafowl is also common. Mayfield has 2 main types of peafowl: India Blue and Black-Shoulder. The Black-Shoulder type is actually a mutation of the India Blue. The Black-Shoulder peahens are mostly white. 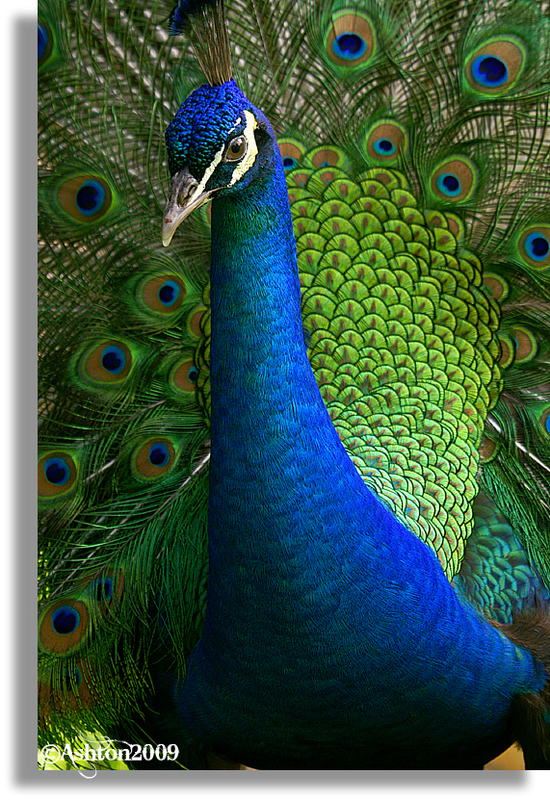 India Blue peacocks have a blue chest, neck and head, with green and gold feathers that appear to change colors depending on lighting. Their shoulders are white and black striped. 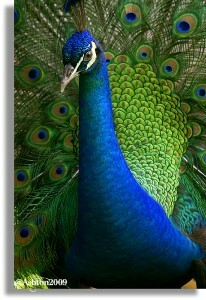 Black-Shoulder peacocks have similar coloring of the India Blue but their shoulders are solid iridescent black. 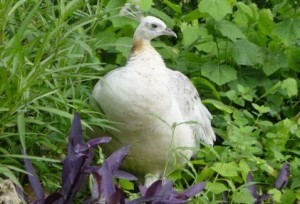 The white colored peahens are the Black-Shoulder type. Peafowl have been at the park since 1935 when friends gave Dr. and Mrs. Gutsch a pair for Christmas. They added more over the years in addition to the descendents of the original pair. Most of the peacocks at Mayfield Park are descendents of the original stock. 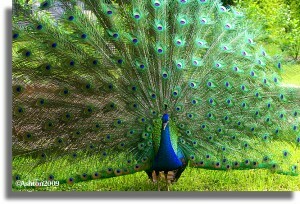 Mating season starts around February when the peacock tail feathers are grown out. The eggs appear 15-30 days after mating. Peachicks sometimes hatch as early as April or May and as late as August. The peahens may lay 7 to 17 eggs throughout the mating season – one every other day at dusk and lets out a loud “honk”, until she has laid all her eggs. After she has laid all her eggs she runs a fever and sits on the nest to incubate the eggs. Incubation takes 28 days. Sometime between mid July or the first part of August the male’s tail feathers fall out and mating season is over. People flock to the park during this time to gather peacock feathers. The peachicks wing feathers grow very fast. When they are just a few days old they can fly. Before they can fly they may hop onto the peahen’s back to get up into the trees away from predators. 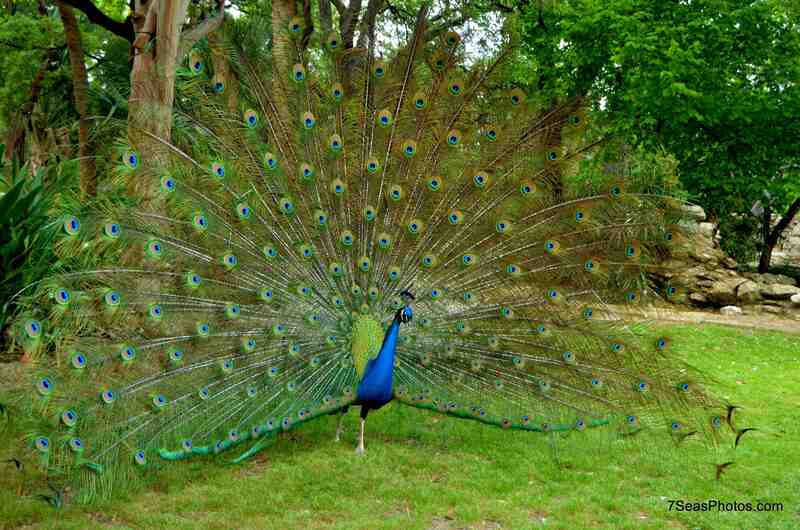 The average peacock’s train (tail feathers) contains more than 200 feathers. The eye of the fan feathers is believed to have magical powers by some. The large cage at Mayfield Parkand Preserve is sometimes used to segregate peafowl if needed. Committed volunteers feed the peafowl high quality food every day in the late afternoon or evenings. The Mayfield Park caretakers also feed the peacocks. 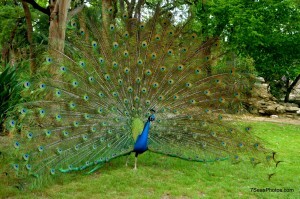 Although it may seem exciting for park visitors to feed the peacocks, it is discouraged. If you would like to find out more information attend one of the Mayfield Garden Tours. When visiting Mayfield please show respect for the peafowl in their home and do not chase them. An India Blue peahen and her new chicks. 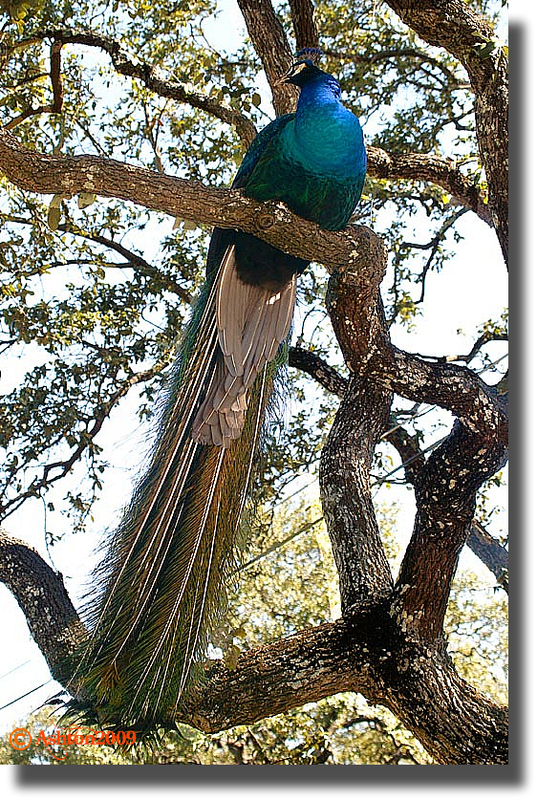 The white peahens are Black-Shouldered peahens. The White Peahen cares for her peachicks.